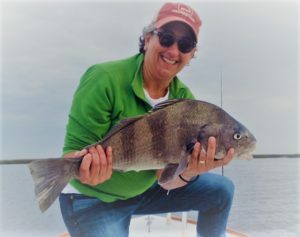 There is no gender or cultural bias in the sport of fishing. Mostly, because the fish don’t care who is catching them! There is no discrimination in acquiring a license. Mostly, because everyone can get one and you don’t even have to take a test! Anyone can fish. From kids to seniors, the trout steam is your playground! We, at Stream and Brook, have the same philosophy. We have a very diverse group of guides that can show anyone a good time. As long as you respect the outdoors and like to have fun, we don’t have any bias. The stream is our playground, too! Women actually make up a very large percentage of new people entering into the the industry. We have been making an effort to procure a couple of ladies to help strengthen our guide team. This year we found two incredible gals who are willing to take the plunge as rookies. 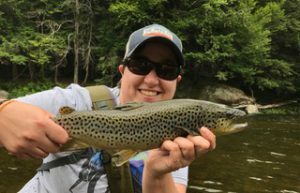 Jamie Eisenburg, will provide her years of experience and knowledge of waters in northern Vermont and Jen Goodale will provide insight, instruction and savvy on waters to the south. Both will show that women are definitely worthy of a place in what many women perceive to be a man’s sport. Read more about them http://streamandbrook.com/about-us/. Speaking of women, Mother’s Day is fast approaching. 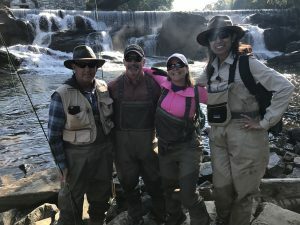 Don’t let your mother or the mother of your children miss out on the women’s movement in fly fishing. Get the special mother in your life a gift certificate for a fun, laid -back lesson, or an exciting guided trip into some of the most beautiful places in Vermont. Remember, the steam is your playground! Previous River Report 4/16/18Next Northern VT River Conditions: Fairfax to Derby.